Miami, Okla. – Friday, Nov. 16, 2018 ¬- The Northeastern Oklahoma A&M College (NEO) Horse Judging team finished their season by taking Reserve Champion and Third High Teams at the 2018 American Quarter Horse Association (AQHA) World Show Intercollegiate Horse Judging Contest. The contest was held on November 10, in conjunction with the AQHA World Show in Oklahoma City. NEO competed against other two-year colleges and along with claiming two of the top three spots, also had two dozen top-ten individual finishes, with Cheyenne Detherow finishing Reserve High Individual overall. 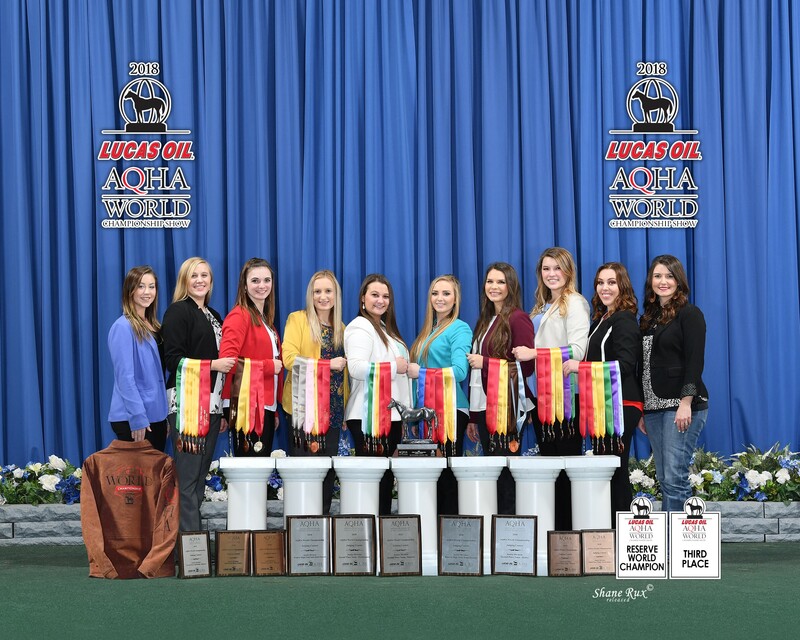 NEO fielded two teams and the NEO Gold Team, consisting of Hannah Jenkins, Rachel Harper, Sierra McCullough, and Nathania McKenzie were named the AQHA Reserve World Champions. The Blue Team of Cheyenne Detherow, Kayla Burns, Abigayle Hays, and Baily Summers finished third. In addition to team success, NEO secured six of the top ten overall individual scores. Detherow, a sophomore Agriculture Business major from Ozark, Mo., finished five points off the leader and won the performance class. She was joined in the top five by Hannah Jenkins and Rachel Harper. For their success, the teams were awarded a total of $2,000 in scholarships. Second – Cheyenne Detherow: Ozark, Mo. Fourth – Hannah Jenkins: Ozark, Mo. Fifth – Rachel Harper: Yukon, Okla.
Eighth – Kayla Burns: Molalla, Ore.
Tenth – Abigayle Hays: Claremore, Okla.
Third – Hannah Jenkins: Ozark, Mo. Fourth – Cheyenne Detherow: Ozark, Mo. Sixth – Baily Summers: Ozark, Mo. Ninth – Rachel Harper: Yukon, Okla.
First – Cheyenne Detherow: Ozark, Mo. Sixth – Hannah Jenkins: Ozark, Mo. Seventh – Abigayle Hays: Claremore, Okla.
Tenth – Kayla Burns: Molalla, Ore.
Sixth – Abigayle Hays: Claremore, Okla. Seventh – Baily Summers: Ozark, Mo. Eighth – Nathania McKenzie: Gravette, Ark.